House Of Doolittle at ReStockIt.com. They may be the House of Doolittle, but they do A LOT to help the environment. They offer 100% post-consumer paper for your home or office. Let’s face it; We all need to do our part to maintain a sustainable environment. What can I, one small person, hope to achieve in this seemingly endless battle against pollution and waste? The solution for the environmentally-conscious consumer is this: RECYCLE, RECYCLE, RECYCLE. The House of Doolittle is proud to aid you in your quest to save the environment by offering recycled paper. That’s 100% post consumer. Post-consumer recyclables are what to look for when choosing your recycled materials. When it’s 100% post-consumer, that means that businesses and customers have already used it once and if it they hadn’t recycled it would have gone to a landfill. House of Doolittle rescues this paper from the landfills and returns it to the consumer so that there’s no waste involved. House of Doolittle has been in business since 1919, supplying America with its office supplies and paper products for more than 90 years. Since 1990, House of Doolittle has offered recycled paper products to its customers. This year, they are pleased to announce that now all of their products are made from 100% recycled paper and products. They specialize in office supplies and products including desk pads, appointment planners, wall calendars, laminated planners, academic products, non-dated products and US/World maps. With all that paper they use, it’s a good thing they’ve gone green! They also use soy ink. The quality is better than ever and they have converted all of their products without raising price. Since 1989, House of Doolittle has donated 5% of its profits to organizations that are working to create a more sustainable environment. House of Doolittle is an industry leader when it comes to offering customers low-cost solutions for their paper (especially wall and desk calendar) needs. 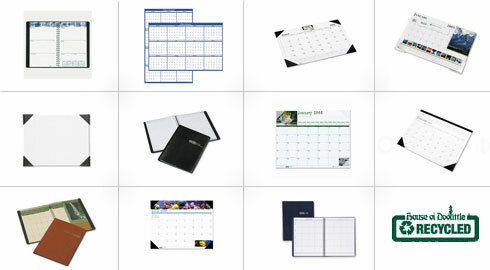 They offer a whole host of products ranging from calendars, planners and organizers to school and presentation supplies to wall and desk calendars at unbeatable prices in the most eco-friendly environment you can imagine. Not only are these products green-friendly, but you can find them at unbeatable prices here at Restockit.com. Restockit.com is please to offer House of Doolittle calendars, planners, organizers and other office supplies as one of our Green Products that are certified to be eco-friendly and environmentally nurturing.